Do your berries get moldy a few days after purchase? Does your lettuce wilt shortly after you open the bag? For many Americans the battle against food self life is constant. However, did you know that you can extend the life of certain fruits, veggies, and other items simply by storing them in the correct fridge location? 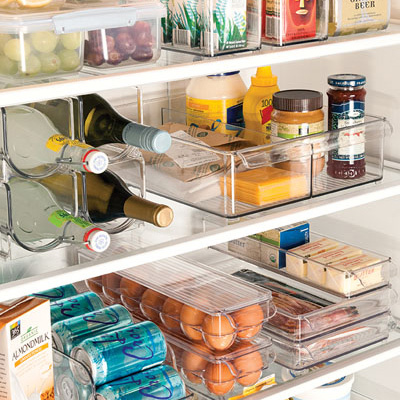 We’ve compiled the best fridge organization strategies right here. An overly packed fridge leads to poor circulation and an increase in temperature. Do not store too much at one time if you like your foods to stay fresh. The ideal temperature for your fridge is 40°F. Use bins, containers and labels to organize the space. Larger items (juice cartons, etc.) go towards the back and smaller items are towards the front. Review fridge contents daily and remove rotten food as soon as possible. This will help keep the other items fresher longer. Crisper: Store fruits here, but keep in mind the preferred separation of certain items. A full list is below in the ‘Specific Foods’ section. Bottom Drawer: This is the warmest place in the fridge, so it is best suited for veggies. Skinny Top Drawer: Store deli meats and cheeses here. Door: Do not store foods that are sensitive to temperature changes (ex. eggs) in the door. Items like condiments and glass jars are best suited for this location. Top Shelf: Dairy, including milk and eggs is best stored here. Bottom Shelf: Raw meat, poultry and fish should be stored here. Freezer: Items that you’ll have long term should be sealed tightly and stored with like-items here. Ethylene-Releasing Foods: Certain foods release a gas that causes other fruits to spoil more quickly. Store these separately and or in a sealed container. Examples include: Melons (except watermelon), Apples, Figs, Avocados, Nectarines, Pears, Plums, Peaches, Tomatoes, and Unripe Bananas. Ethylene-Effected Foods: These fruits are especially effected by the gas, so store them as far apart as possible: Ripe Bananas, Cucumbers, Carrots, Brussels Sprouts, Lettuce (& other leafy greens), Squash, Parsley, Peas, Watermelon, Peppers, Cabbage, Sweet Potatoes, and Cauliflower. Berries: Keep in their original containers and do not wrap tightly. Cheese: Wrap tightly or use sealed bags. Eggs: They are still good for 3-5 weeks after the ‘sell-by’ date. Keep them in their original container for the longest shelf life. Lettuce: Seal in a glass jar for a longer shelf life. For a full list of specific fruit and veggie storage tips check out this post by My Thirty Spot. Vacuum Sealers help keep foods fresh longer. They are especially useful for freezer items. Labels ensure you know what’s inside your sealed items. They also help family members know where things live. Clear Plastic Containers with lids are perfect for leftovers. Clear Bins can separate shelve goods.